Aftermarket Capabilities – Davis-Standard’s ability to service equipment for nearly every extrusion and converting application, including non-Davis-Standard brands, is one of the company’s greatest advantages. This includes an extensive spare parts inventory, timely 24/7-customer service, global technical capabilities, and rebuild and retrofit services. Super Blue® Extruder – This high-efficiency extruder offers advantages in price, performance and fast delivery. The Super Blue is equipped with preferred features including a low noise, high-torque double reduction gearbox; cast aluminum finned heaters bolted to the barrel; an AC drive and motor; and a high capacity air-cooling system. It has been an effective option for pipe and profile, sheet, fiber and specialty system processes, among others. MEDD Extruder – This compact extruder is optimized for cleanroom environments with a replaceable feed section liner and direct drive technology for greater efficiency and materials flexibility. Davis-Standard offers a high-tech melt pump system to maximize stability when processing sensitive materials. Davis-Standard supports applications for Alternate Polymer®, microbore tubing, multi-lumen and catheter tubing, endotracheal and tracheotomy tubing, radio-opaque tubing, bubble tube, taper tube, pipette tubing and multi-layer tubing, among others. Turn-key medical tubing systems support extruder outputs up to 700 pounds per hour (315kg/hr) and line speeds up to 800 feet per minute (240 mpm) for a range of materials including PLA, PLLA, PEEK, FPVC, polyurethane, nylon, PEBAX and FEP. Davis-Standard supplies versatile extruder options depending on process and application, including the direct-drive MEDD extruder, small-footprint HPE-A and HPE-H extruders, and the high-performance Super Blue® extruder. All extruders are engineered for a fast delivery and competitive pricing. For added precision, Davis-Standard offers a high-tech melt pump to minimize heat exposure and for exacting temperature control and pressure. Sheet Extrusion – Davis-Standard supplies complete systems and components to support the packaging and industrial sectors. One recent development is the DS-Helibar® extruder. 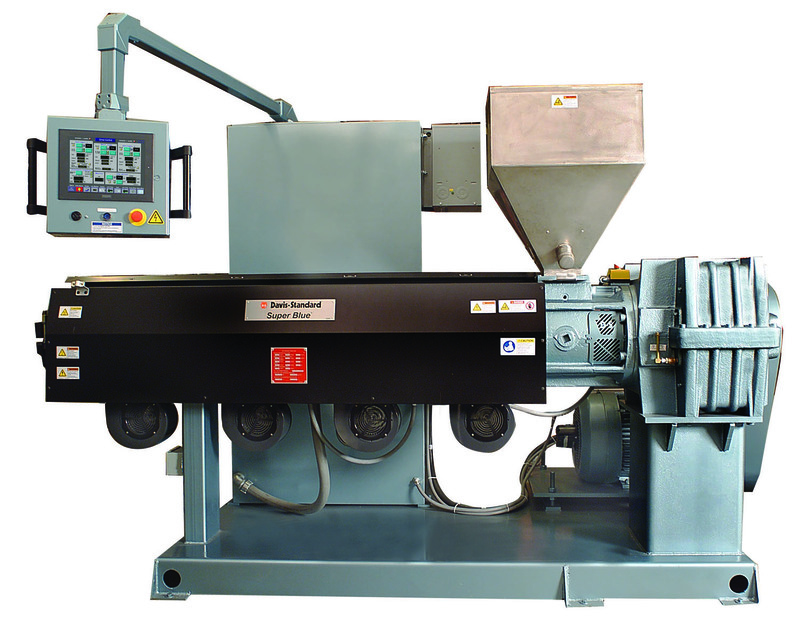 This extruder is the next generation in Davis-Standard’s groove feed extruder offering. With the Helibar design, helical grooves inside the barrel run along the entire barrel bore. This technology has been shown to increase extruder output rates while improving energy efficiency and reducing barrel and screw wear. Other advantages include lower start-up costs, shorter residence time and the ability to process higher levels of regrind. These are especially beneficial for high-profile applications where speed, melt quality and efficiency are paramount. 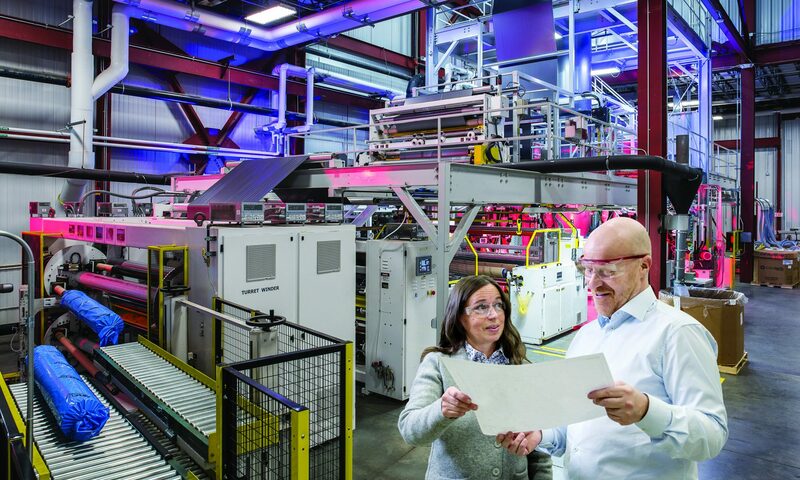 As a complement to its sheet extrusion technology, Davis-Standard recently acquired Thermoforming Systems LLC (“TSL”) of Union Gap, Washington. TSL (www.tslusa.biz) designs, manufactures and markets thermoforming equipment to the food packaging industry. Cast Film – Davis-Standard offers a stretch film line that redefines modular efficiency for high-grade film operations. This technology is the new standard for stretch film line configurations. Advantages include a compact machine arrangement, ease of operation and servicing, excellent profile control, consistent roll quality and an intuitive control package. The system is engineered for producing thin films from 7.8µ to 13µ (31-to 51-gauge) at high speeds. Davis-Standard’s side-by-side DS S3 overlapping winder is essential to this capability. The DS S3 winder enables maximum slit widths for hand-wrap, machine-wrap and jumbo rolls. All rolls are discharged on the downstream end of the winder and are conveyed to a common side of the line to simplify roll packing and future automation. There is an auxiliary lay-on roll to eliminate top-wind waste during transfer, optimizing roll quality and eliminating outer wrap transfer waste. There is a 30-second cycle time regardless of the number of slit widths, ideal for hand-wrap products. Specific to CPP films, Davis-Standard offers the horizontal ironing roll winder. This winder has an adjustable ironing roll which allows the converter to control the amount of air introduced into the winding roll, substantially reducing “tin canning,” a common issue when running CPP. Blown Film – Davis-Standard supplies extrusion systems for applications in high-barrier food packaging, agricultural films, geomembrane, stretch film, printing and laminating films, flexible packaging, collation shrink films and stretch hooders. For films that require enhanced clarity and flexibility, Davis-Standard offers the Aquafrost® water-quench system. Other options include industry-leading Vector® air rings, DSB® feedscrew designs, and Streamlined Coextrusion Die (SCD®), Optiflow and Vertex dies, each designed to process specific films. Davis-Standard also supplies downstream and terminal equipment as well as MDO’s, oscillating haul-offs, and winders to optimize web handling and output goals. These solutions can accommodate standard applications as well as complex substrates and structures requiring precise tension control to ensure quality while minimizing waste. Automation options are available to reduce cycle time and augment benefits from increased outputs. For more information prior to Plastimagen, visit www.davis-standard.com.